Hakusan, Japan, April 23, 2014 – EIZO Corporation (TSE: 6737) today announced the release of the FlexScan S1933, a 19-inch monitor with a 1280 x 1024 native resolution for large and small offices and control rooms that require a traditional square format. The FlexScan S1933 features an IPS (in-plane switching) LCD panel with wide 178° viewing angle that minimizes color shift and contrast changes when viewing the screen at an angle. This ensures stable and consistent display when two or more people view the screen at once or in a multi-monitor environment. The FlexScan S1933 comes with an LED backlight that is mercury free and lowers power consumption to 12 watts during typical operation and less than 0.5 watts in power save mode. The monitor is also easy on the eyes. An ambient brightness sensor called Auto EcoView and a preset mode called Paper mode lower the monitor’s brightness and color temperature respectively to reduce the blue light output which can cause eye fatigue. A non-glare screen reduces eye fatigue by dissipating reflective light that otherwise makes the screen difficult to view. Furthermore, the surface of the bezels is treated to prevent light reflection. Several other preset modes including sRGB and Custom (user-defined settings) modes are included. The user can toggle between modes manually in the on-screen display menu or automatically by using the bundled ScreenManager Pro for LCD software (Windows 8, 7 and Vista compatible) to assign a mode to each application. An ergonomic stand allows for adjusting the screen to a comfortable position. The stand offers 100 mm height adjustment, 30° tilt, 70° swivel, and portrait-mode viewing. A basic stand with 30° tilt is also available. 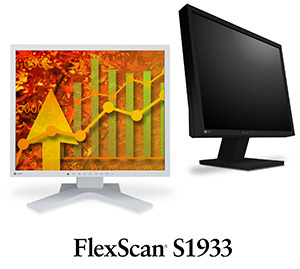 The FlexScan S1933 complies with stringent international standards for power consumption, the environment, and ergonomics like EPA Energy Star 6.0, EPEAT Gold, and TCO Certified Displays. The FlexScan S1933 comes with a five-year manufacturer’s warranty*. This is two years longer than the three-year warranty of most monitor brands and contributes to a low total cost of ownership. EyeCare mode that lowers brightness to 3 cd/m2 to help reduce eye fatigue in dimly-lit offices. DVI-D 24 pin, and D-Sub mini 15 pin inputs. Compatibility with older graphics boards that output a sync-on-green signal. The FlexScan S1933 is now shipping. Date of availability varies so please contact the EIZO subsidiary or distributor in your country for details.